There are other powers available (14x, 20x, etc.) but 10x magnification is the standard. 10x loupe costs a nominal amount and is worth the investment if you are interested in learning more about your diamond and its natural characteristics. Diamonds may be referred to as “clean to the naked or unaided eye” or “eye clean,” which refers to diamonds that appear free of visible inclusions when viewing them without magnification. On the high-end of diamond clarities are the VVS and Flawless grades. These high-grade clarities are the cleanest diamonds. When combined with whiter color grades, the VVS+ can be very expensive per carat compared to the values per carat for diamond in the VS or SI ranges. When selling a high clarity diamond with color in the DEF color, the diamond needs to be very well cut. Diamond dealers and private buyers want excellent cut diamonds when buying this quality of diamond. Therefore, if you are selling a diamond with an expensive per carat value, the cut should be comparable to the price. Meaning, DEF color with VVS+ clarities should be Excellent to Very Good Cut along with a polish and symmetry that is, at a minimum, very good and preferably excellent. The lesson to be learned is that if your diamond has only “good or fair” symmetry and the per carat price is high, you should expect to sell your diamond at a significant discount compared to better cut diamonds. This is a reality in the diamond market. With the diamond grading report gaining public awareness, all buyers have become more knowledgeable and expect more when spending serious money for diamonds. VS is in the mid-range for quality diamond clarities. VS diamonds contain minor inclusions that are somewhat difficult for a trained grader to see under 10x power magnification. Although the clarity characteristics may be plain under magnification, they have very little effect on the beauty of the diamond. The VS clarity range is popular as they are clean diamonds that don’t carry the higher price of a VVS clarity diamond. Slightly Included number 1 and 2 (SI1, SI2) contain noticeable inclusions that are easy to see for a trained grader to see under 10x magnification. Since no two diamonds are alike, the combination of inclusions vary from stone to stone which makes SI diamonds some of the most difficult diamonds to grade and value. SI clarity diamonds without any black inclusions are preferred, especially if the inclusions located on the perimeter of the diamond. Inclusions located on the perimeter can be hidden by a ring’s prongs once mounted and the center of the diamond appears clean, like a VS+ diamond. SI inclusions can be centrally located and distracting under a loupe, which can turn off a buyer. Or worse yet, they may be visible upon first glance. The misconception in the diamond business is that all SI2 diamond are “eye clean”. This is far from the truth and inaccurate. Many SI diamond, especially in larger diamonds, are clearly visible to the “naked or unaided eye” (i.e. without magnification). Most GIA certified diamonds in the SI clarity range will not have inclusions visible to the unaided eye. But from our experience, we have regularly seen SI inclusions that are visible to the naked eye without magnification on larger diamonds (2.0 carats and above), both in GIA and other lab certified diamonds. SI clarity diamonds that are visible to the unaided eye sell at a discount compared to diamonds that possess SI inclusions and cannot be seen without a 10x loupe. Diamonds that sell well to the average United States consumer are usually in the SI2 to VS2 range, usually with a color to match, in the G to J color range. This makes the diamond much more affordable compared to DEF color and VVS clarity diamonds. Diamonds that are “imperfect or included” (i.e. I1, I2, I3) are on the lower end of the clarity scale. The face up appearance of an included diamond varies from one stone to the next. A diamond buyer knows he or she will not normally see any inclusions without magnification in the SI to VVS range. However with imperfects stones, this is never consistent. Some I1s can be completely “eye-clean” and brilliant, but under a loupe they can be filled with inclusions. 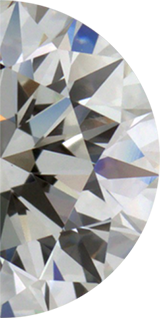 Inclusions can easily be seen with the naked eye in other I1 clarity graded diamonds. Highly included diamonds, visible to the “naked eye”, are often referred to as “commercial grade diamonds”. These diamonds are much more affordable and common in retail jewelry stores. Some of these diamonds can still display brilliance similar to a cleaner diamond, but for a fraction of the cost. This price difference does make them popular to the general public. It is often necessary to have such a diamond certified before you sell, since it may have been treated. Diamonds are often laser drilled or fracture filled to remove or reduce the amount of distracting black inclusions. It is also important for buyers not buy an uncertified diamond, so to avoid buying a treated diamond unknowingly. But many of these commercial grade diamonds are so included that their brilliance and light dispersion is negatively affected. Diamonds with many “clouds” can appear dull or sleepy. Diamonds with SI or Imperfect clarity grades that are “based upon clouds” have little to no life and beauty. Included diamonds that are riddled with “black and white” inclusions are diamonds with low per carat values. The nature of the inclusions in your diamond will play a role in determining a price and value. Since diamonds are natural minerals that come from the ground, it is not uncommon to have other minerals within your diamond. Inclusions include crystals, knots, twinning wisps, needles, clouds, pinpoints, feather (small cracks within the diamond), graining, cavities, chips, nicks and bruises. Dealers often use the term “salt and pepper” to describe the black and white inclusions that are dispersed throughout a diamond. As a general rule of thumb, it’s better not to have black carbon in the diamond, whether visible to the unaided eye or not. Black inclusions are noticeable to the naked eye and can be distracting which can lead to devaluing the price of your diamond. What is often referred to as “black carbon” is really graphite. The distinction is not as important as the fact that the black inclusions will make the diamond worth less than compared to white inclusions that are not obvious upon first glance. But keep in mind that every diamond is different, so this is a generalization that doesn’t apply to every diamond. The Diamond Trade will buy all grades of diamond, even included diamonds. If we find the overall diamond’s “material” to have value, we will pay you top dollar for your diamond.